Liu, Y., Kim, H. and Römling, U. (2018). In vivo Analysis of Cyclic di-GMP Cyclase and Phosphodiesterase Activity in Escherichia coli Using a Vc2 Riboswitch-based Assay. Bio-protocol 8(5): e2753. DOI: 10.21769/BioProtoc.2753. Cyclic di-guanosine monophosphate (c-di-GMP) is a ubiquitous second messenger that regulates distinct aspects of bacterial physiology. It is synthesized by diguanylate cyclases (DGCs) and hydrolyzed by phosphodiesterases (PDEs). To date, the activities of DGC and PDE are commonly assessed by phenotypic assays, mass spectrometry analysis of intracellular c-di-GMP concentration, or riboswitch-based fluorescent biosensors. However, some of these methods require cutting-edge equipment, which might not be available in every laboratory. Here, we report a new simple, convenient and cost-effective system to assess the function of DGCs and PDEs in E. coli. This system utilizes the high specificity of a riboswitch to c-di-GMP and its ability to regulate the expression of a downstream β-galactosidase reporter gene in response to c-di-GMP concentrations. In this protocol, we delineate the construction of this system and its use to assess the activity of DGC and PDE enzymes. Cyclic-di-GMP is an important and ubiquitous second messenger in bacteria, which regulates a variety of processes, such as motility-to-sessility transition, biofilm formation, virulence, and cell cycle progression (Römling et al., 2013). The GG(D/E)EF domain has diguanylate cyclase (DGC) activity and it is responsible for the synthesis of c-di-GMP from two GTPs, which is a two-step reaction with 5’-pppGpG as intermediate and two molecules of pyrophosphate as by-products (Ryjenkov et al., 2005). Phosphodiesterases (PDE) with an EAL or an HD-GYP domain hydrolyze c-di-GMP into linear 5’-pGpG (Schmidt et al., 2005) and GMP (Ryan et al., 2006), respectively. Several tools have been developed to monitor intracellular cyclic di-nucleotide levels and to identify proteins involved in cyclic di-nucleotide signaling, for example, protein-based fluorescence resonance energy transfer (FRET) biosensor (Christen et al., 2010), riboswitch-based fluorescent biosensor (Kellenberger et al., 2015), and riboswitch-based dual-fluorescence reporter (Zhou et al., 2016). However, these tools monitor altered fluorescence of reporters and require the access to flow cytometry or fluorescence microscopy. Here, we report the development of an alternative assay to monitor the intracellular c-di-GMP concentration, namely by monitoring the alteration in β-galactosidase activity in agar-growing cells. For that, the Vc2 riboswitch (Sudarsan et al., 2008) is fused translationally to lacZY and integrated into the chromosome of E. coli strain TOP10. Vc2 is an ‘off’ riboswitch from Vibrio cholerae and thus down-regulates the expression of β-galactosidase when c-di-GMP is bound (Figure 1). The stable integration into the Tn7 attachment site in the chromosome of E. coli avoids copy number effects and eliminates the need to use an antibiotic resistance marker. Changes in c-di-GMP levels are subsequently translated to the alteration in β-galactosidase expression, which is reflected by the color change of the colony growing on an agar plate containing 5-Bromo-4-chloro-3-indolyl-β-D-galactopyranoside (X-gal). This assay can be used, for instance, to reveal the function of proteins under physiological condition and to assess the enzymatic activity of proteins that are challenging to be purified and tested in vitro. However, the Vc2-based assay described here is a qualitative assessment of the change in intracellular c-di-GMP concentration. Quantification is not crucial for a screening assay, but would be advantageous in, for example, measuring the activity of enzymes. We have demonstrated that the Vc2-based assay can be exploited to verify the activity of both DGCs and PDEs in vivo (El Mouali et al., 2017). Figure 1. The principle of a riboswitch-based screening system. 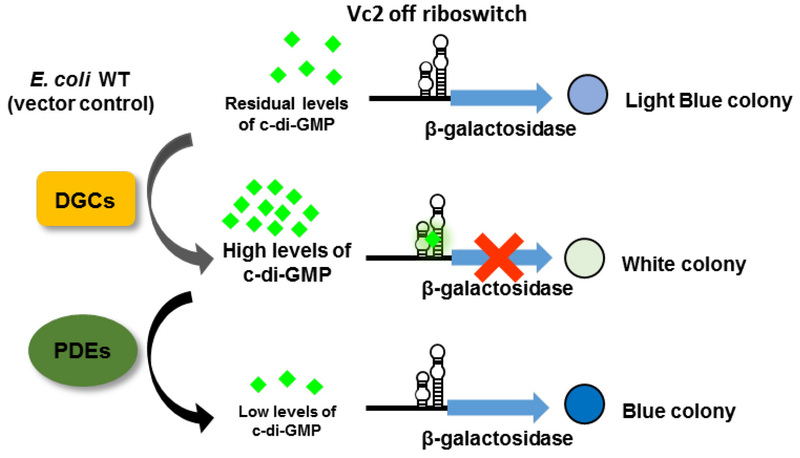 The Vc2 riboswitch is located upstream of the β-galactosidase open reading frame to control its expression in response to the variation in c-di-GMP concentration. When c-di-GMP is present in high abundance due to the overexpression of DGCs, the expression of β-galactosidase is down-regulated resulting in a white colony on an X-gal containing plate. In contrast, when PDEs are overexpressed, generating low intracellular c-di-GMP concentration, the colony is blue. In E. coli TOP10 wild type cells, there are residual amounts of c-di-GMP, resulting in a light blue colony (adapted from El Mouali et al., 2017). aThe restriction sites are underlined. Practically, the workflow can be divided into two parts, as shown in Figure 2. The first part is to construct the reporter strain, which takes approximately 12-15 days (Steps 1-3 of the protocol). The second part is to assess the activity of DGC and PDE by the reporter strain (Steps 4-5). This will take 7-9 days. Figure 2. The overview of the workflow. The procedure is divided into two parts: 1) construction of the reporter strain and 2) assessment of c-di-GMP cyclase or phosphodiesterase activity by the reporter. It takes approximately 12-15 days to construct the reporter strain, and another 7-9 days to assess the target. 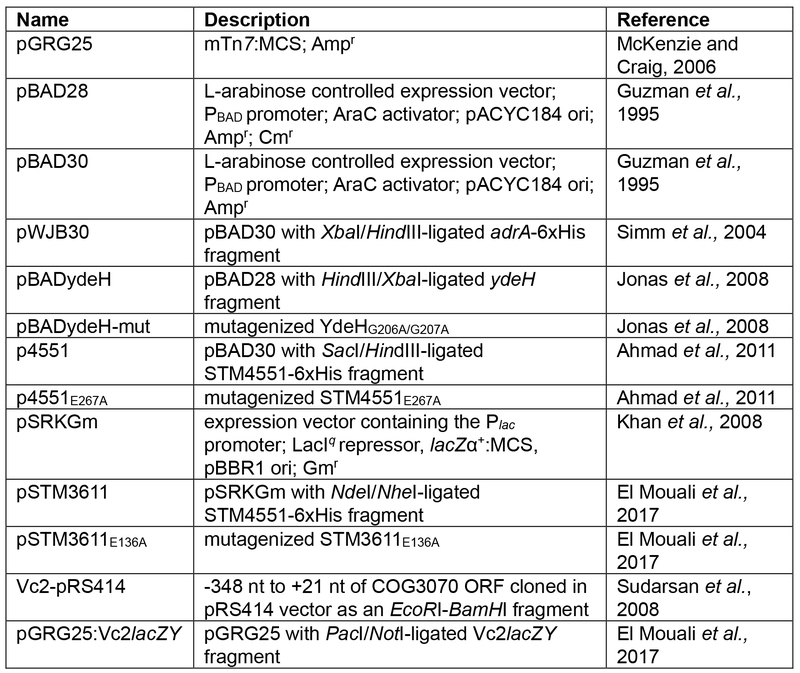 The template for the PCR is Vc2-pRS414 (kindly received from Prof. R. R. Breaker, Yale University), in which the fragment containing riboswitch along with its native promoter was cloned in frame to the lacZ reporter gene (Sudarsan et al., 2008). The restriction sites PacI and NotI are underlined. Check the PCR products by gel electrophoresis using 1% TAE agarose gel. The expected size is 4,733 bp. Double digest the PCR product Vc2lacZY and the plasmid pGRG25 with PacI and NotI at 37 °C overnight. To reduce star activity, it is advisable to use the fewest units possible to achieve the digestion. After digestion, it is necessary to check the size of products using agarose gel electrophoresis. The enzymes are inactivated at 65 °C for 20 min. Remove the restriction enzymes using PCR purification kit. The concentration of digested Vc2lacZY and pGRG25 are measured by NanoDrop. Ligate pGRG25 and Vc2lacZY of molar ratio 1:1 at 12 °C overnight using T4 DNA ligase following the manufacturer’s instruction. To verify that the vector is completely cut, ligate the digested vector alone. If the vector is not cut by the two restriction enzymes efficiently, re-circulation will happen and colonies will appear after transformation. Transform the ligation products into chemically competent TOP10 cells and select for the recombinant plasmids on LB agar plate containing 100 μg/ml ampicillin. The pGRG25 vector is temperature-sensitive, so the plate should be incubated at 32 °C or even lower temperature. The details for the colony PCR can be found in the protocol by Azevedo et al. (2017). Confirm the sequence integrity of the riboswitch in the positive clones by DNA sequencing using the same primers for colony PCR. Streak positive colonies on LB agar plate supplemented with 100 μg/ml ampicillin and incubate the cells at 32 °C. Inoculate approximately 10 colonies into 3 ml of ampicillin-free LB medium at 32 °C, 200 rpm. Add 0.1% L-arabinose (w/v) to facilitate the incorporation of Vc2lacZY into E. coli Tn7 attachment site. The integration results in a new strain E. coli TOP10 attTn7::Vc2lacZY. Dilute the overnight culture by a factor of 108 and plate 50 μl of the diluted culture on LB plate to acquire single colonies. 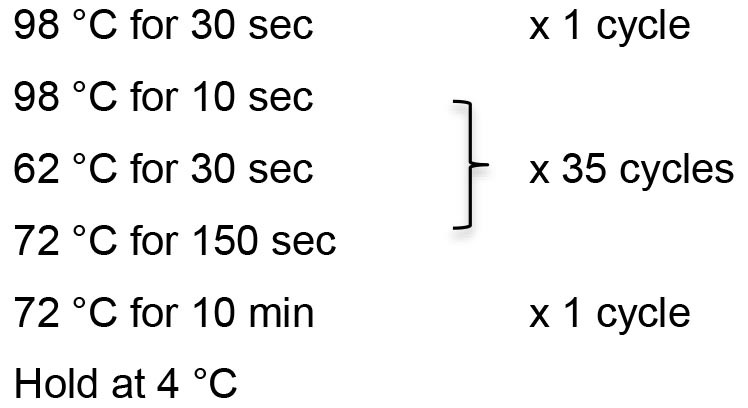 Incubate the plate at 42 °C to block the replication of the temperature-sensitive pGRG25 vector. Streak individual colonies on LB plate and repeat the incubation at 42 °C to make sure that the plasmid is lost. The expected size for positive clone and control is 6,328 bp and 678 bp, respectively. Prepare calcium chloride competent E. coli TOP10 attTn7::Vc2lacZY cells. Transform pBAD vectors (Note 2) harboring DGC (AdrA, YdeH and STM4551) and catalytically inactive mutants (STM4551E267A and YdeH-mut) as well as empty vectors into the chemically competent cells by heat shock at 42 °C for 40 sec. Add 1 ml LB medium free of antibiotics into the microcentrifuge tubes and incubate the tubes at 37 °C, 200 rpm for 1 h to let the cells recover. Plate 200 μl cells on LB agar plates containing 100 μg/ml ampicillin and incubate the plates at 37 °C overnight. Streak single colonies on ampicillin-containing LB agar plates. Pick one colony for each strain and culture the colony in 5 ml of LB medium with 100 μg/ml ampicillin at 37 °C, 200 rpm overnight. Measure the OD600 of overnight culture and adjust the OD600 to 0.1. Grow cells at 37 °C, 200 rpm. When OD600 reaches 0.6-1.0, spot 3 μl culture on LB plates with the addition of 100 μg/ml ampicillin, 80 μg/ml X-gal, 0.1% (w/v) L-arabinose (Note 3). It is important that cells with DGC, corresponding mutant, and vector control have similar OD600. Incubate the plates at 28 °C and monitor the color of colonies up to 72 h. A DGC activity will lead to a white colony indicative of high c-di-GMP levels. Take pictures of the plate using a digital camera. The intracellular concentration of c-di-GMP is low in TOP10 cells, therefore Vc2lacZY-harboring cells have a basal level of β-galactosidase activity resulting in a blue colony, which makes it impossible to distinguish the color further enhanced by phosphodiesterase. The activity of PDE can, however, be reliably investigated by co-expression of a DGC. Therefore, pWJB30 (DGC AdrA cloned into pBAD30) and pSTM3611 (PDE STM3611 cloned into pSRKGm) (Notes 2 and 4) are co-transformed into chemically competent TOP10::Vc2lacZY cells. As controls, empty vectors are co-transformed or in combination with the DGC/PDE. The combinations are listed in Table 1. Plate cells on LB agar plates containing both ampicillin (100 μg/ml) and gentamicin (30 μg/ml). The plates are incubated at 37 °C overnight. Streak the positive colonies on antibiotics-containing LB agar plates. Inoculate at least three individual colonies per strain in 5 ml of LB medium containing both ampicillin and gentamicin. Grow cells at 37 °C, 200 rpm overnight. Measure OD600 of overnight culture and dilute the culture to OD600 of 0.1 with LB medium containing antibiotics. Let the cells grow to exponential phase (OD600 ~0.6). It is critical that all samples have similar OD600 values. Spot 3 μl of the cultures on LB agar plates containing ampicillin (100 μg/ml), gentamicin (30 μg/ml), IPTG (0.75 mM), L-arabinose (0.003%, w/v) and X-Gal (80 μg/ml) (Note 3). Incubate the plate at 28 °C and record the color of the colonies up to 72 h. While expression of the DGC alone leads to white colonies, co-expression of an active PDE will lead to blue colonies. Take pictures of the plate using a digital camera. Assessment of the activity of DGC by the Vc2-based assay: after spotted on X-gal containing plates, the color of colonies is monitored periodically. Figure 3 shows the color after 24 h incubation at 28 °C. It is explicit that cells expressing DGCs have whiter color due to the riboswitch inhibition of β-galactosidase expression upon high c-di-GMP levels compared with the corresponding mutant and vector control. Figure 3. Detection of established diguanylate cyclases by the Vc2-based assay. DGC AdrA, STM4551 and catalytic inactive STM4551E267A were cloned into pBAD30 generating pWJB30, p4551 and p4551E267A, respectively. Another DGC YdeH and its mutant YdeHG206AG207A were cloned into pBAD28 resulting in pBAD28ydeH and pBAD28ydeH-mut. Cells expressing functional DGC (AdrA/STM4551/YdeH) are white, while cells with vector control or catalytically inactive mutant (STM4551E267A/YdeHG206AG207A) are blue. Growth was at 28 °C for 24 h on LB agar plates supplemented with 100 μg/ml ampicillin, 80 μg/ml X-gal and 0.1% arabinose (w/v). 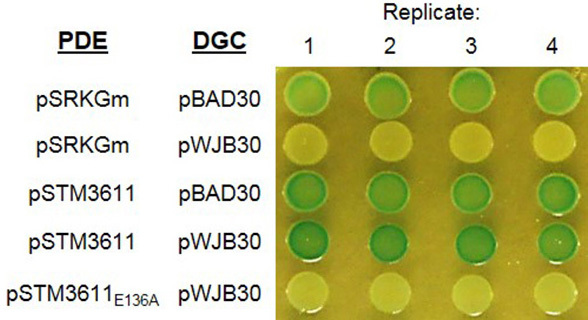 Assessment of the enzymatic activity of a PDE by the Vc2-based assay: Figure 4 shows the color of colonies after incubation at 28 °C for 48 h. Cells expressing the DGC AdrA alone (row 2) or co-expressing AdrA and catalytically inactive PDE STM3611E136A (row 5) are white. However, cells are blue when wild type STM3611 is co-expressed with AdrA (row 4), which illustrates the enzymatic activity of STM3611 and the decrease of the intracellular c-di-GMP concentration upon expression. Figure 4. Detection of phosphodiesterase activity of PDE STM3611 by the Vc2-based assay. Phosphodiesterase STM3611 and catalytic inactive STM3611E136A were cloned into pSRKGm generating pSTM3611 and pSTM3611E136A, respectively. Diguanylate cyclase AdrA was cloned into pBAD30 resulting in pWJB30. Cells expressing the DGC AdrA alone have a white color. Upon co-expressing the PDE STM3611 with AdrA, the color turns to blue indicating low c-di-GMP level. However, cells expressing the DGC AdrA with catalytically inactive PDE STM3611E136A are white. Growth was at 28 °C for 48 h on LB agar plate supplemented with 100 μg/ml ampicillin, 30 μg/ml gentamicin, 80 μg/ml X-gal, 0.003% arabinose (wt/vol), and 0.75 mM IPTG (adapted from El Mouali et al., 2017). The protocol for the integration of target genes into the E. coli chromosomal Tn7 attachment site is delineated by G. J. McKenzie and N. L. Craig (McKenzie and Craig, 2006). We cloned diguanylate cyclases into pBAD28/pBAD30 vectors and phosphodiesterases into the pSRKGm vector. Other expression vectors can also be used depending on the availability. Different L-(+)-arabinose and IPTG concentrations need to be tested to achieve the most discriminating color contrast between diguanylate cyclase, phosphodiesterase and control. It is important that diguanylate cyclase and phosphodiesterase are cloned into compatible vectors containing different antibiotic resistance markers and compatible origins of replication. The specificity of the Vc2-based riboswitch towards other cyclic di-nucleotides has not been tested in this work. The authors would like to thank Prof. Dr. Ronald R. Breaker for sharing Vc2-pRS414 riboswitch construct. Prof. Ute Römling conceived this study. Ying Liu developed the assay and assessed DGC activity. Hyunhee Kim developed the assay to assess PDE activity. This work was supported by the Swedish Research Council for Natural Sciences and Engineering (grant 621-2013-4809) and the Karolinska Institutet. This modified protocol is based on a previously published work (El Mouali et al., 2017). The authors declare no conflicts of interest or competing interests. Ahmad, I., Lamprokostopoulou, A., Le Guyon, S., Streck, E., Barthel, M., Peters, V., Hardt, W. D. and Römling, U. (2011). Complex c-di-GMP signaling networks mediate transition between virulence properties and biofilm formation in Salmonella enterica serovar Typhimurium. PLoS One 6(12): e28351. Azevedo, F., Pereira, H. and Johansson, B. (2017). Colony PCR. Methods Mol Biol 1620: 129-139. Christen, M., Kulasekara, H. D., Christen, B., Kulasekara, B. R., Hoffman, L. R. and Miller, S. I. (2010). Asymmetrical distribution of the second messenger c-di-GMP upon bacterial cell division. Science 328(5983): 1295-1297. El Mouali, Y., Kim, H., Ahmad, I., Brauner, A., Liu, Y., Skurnik, M., Galperin, M. Y. and Römling, U. (2017). Stand-alone EAL domain proteins form a distinct subclass of EAL proteins involved in regulation of cell motility and biofilm formation in enterobacteria. J Bacteriol 199(18): pii:e0079-17. Guzman, L. M., Belin, D., Carson, M. J. and Beckwith, J. (1995). Tight regulation, modulation, and high-level expression by vectors containing the arabinose PBAD promoter. J Bacteriol 177(14): 4121-4130. Hanahan, D. (1983). Studies on transformation of Escherichia coli with plasmids. J Mol Biol 166(4): 557-580. Jonas, K., Edwards, A. N., Simm, R., Romeo, T., Römling, U. and Melefors, O. (2008). The RNA binding protein CsrA controls cyclic di-GMP metabolism by directly regulating the expression of GGDEF proteins. Mol Microbiol 70(1): 236-257. Kellenberger, C. A., Chen, C., Whiteley, A. T., Portnoy, D. A. and Hammond, M. C. (2015). RNA-based fluorescent biosensors for live cell imaging of second messenger cyclic di-AMP. J Am Chem Soc 137(20): 6432-6435. Khan, S. R., Gaines, J., Roop, R. M., 2nd and Farrand, S. K. (2008). Broad-host-range expression vectors with tightly regulated promoters and their use to examine the influence of TraR and TraM expression on Ti plasmid quorum sensing. Appl Environ Microbiol 74(16): 5053-5062. McKenzie, G. J. and Craig, N. L. (2006). Fast, easy and efficient: site-specific insertion of transgenes into enterobacterial chromosomes using Tn7 without need for selection of the insertion event. BMC Microbiol 6: 39. Römling, U., Galperin, M. Y. and Gomelsky, M. (2013). Cyclic di-GMP: the first 25 years of a universal bacterial second messenger. Microbiol Mol Biol Rev 77(1): 1-52. Ryan, R. P., Fouhy, Y., Lucey, J. F., Crossman, L. C., Spiro, S., He, Y. W., Zhang, L. H., Heeb, S., Camara, M., Williams, P. and Dow, J. M. (2006). Cell-cell signaling in Xanthomonas campestris involves an HD-GYP domain protein that functions in cyclic di-GMP turnover. Proc Natl Acad Sci U S A 103(17): 6712-6717. Ryjenkov, D. A., Tarutina, M., Moskvin, O. V. and Gomelsky, M. (2005). Cyclic diguanylate is a ubiquitous signaling molecule in bacteria: insights into biochemistry of the GGDEF protein domain. J Bacteriol 187(5): 1792-1798. Schmidt, A. J., Ryjenkov, D. A. and Gomelsky, M. (2005). The ubiquitous protein domain EAL is a cyclic diguanylate-specific phosphodiesterase: enzymatically active and inactive EAL domains. J Bacteriol 187(14): 4774-4781. Simm, R., Morr, M., Kader, A., Nimtz, M. and Römling, U. (2004). GGDEF and EAL domains inversely regulate cyclic di-GMP levels and transition from sessility to motility. Mol Microbiol 53(4): 1123-1134. Sudarsan, N., Lee, E. R., Weinberg, Z., Moy, R. H., Kim, J. N., Link, K. H. and Breaker, R. R. (2008). Riboswitches in eubacteria sense the second messenger cyclic di-GMP. Science 321(5887): 411-413. Zhou, H., Zheng, C., Su, J., Chen, B., Fu, Y., Xie, Y., Tang, Q., Chou, S. H. and He, J. (2016). Characterization of a natural triple-tandem c-di-GMP riboswitch and application of the riboswitch-based dual-fluorescence reporter. Sci Rep 6: 20871. How to cite: Liu, Y., Kim, H. and Römling, U. (2018). In vivo Analysis of Cyclic di-GMP Cyclase and Phosphodiesterase Activity in Escherichia coli Using a Vc2 Riboswitch-based Assay. Bio-protocol 8(5): e2753. DOI: 10.21769/BioProtoc.2753.